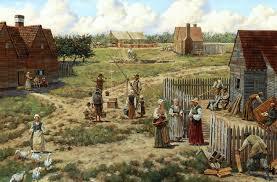 About 350 years ago a shipload of travelers landed on the northeast coast of America. The first year they established a town site. The next year they elected a town government. The third year the town government planned to build a road five miles westward into the wilderness. In the fourth year the people tried to impeach their town government because they thought it was a waste of public funds to build a road five miles westward into a wilderness. Who needed to go there anyway? Here were people who had the vision to see three thousand miles across an ocean and overcome great obstacles to get there. But in just a few years they were not able to see even five miles out of town. They had lost their pioneering vision. , when you face life’s problems, perplexities, trials, and tribulations do you look at things with the eye of faith? When tragedy strikes, or sickness, or death, or calamity, do you face these things with the eye of faith? When you look at the wicked world we live in, a world that we are to conquer in Christ’s name, do you get discouraged and say “What can I do?” When we look at your church and where God is directing you, do you see the Promised Land, or do you see insurmountable obstacles? For two years Israel has been traveling through the wilderness. Now, at last, the people are perched on the southern edge of the Promised Land. How exciting that they are now on the verge of entering the land God had promised to Abraham so many years before. In today’s text only two men (Caleb and Joshua) stood out as men of faith among the millions of Israelites that were brought out of Egypt. In the midst of cowardice and unfaithfulness, Caleb and Joshua took a whole-hearted stand for God’s Word. In this age of Christian luke warmness (Revelation 3:15-19), may we be whole-hearted Christians (Colossians 3:23 “And whatsoever ye do, do it heartily, as to the Lord, and not unto men.”) The following four things are evidence of a whole-hearted Christianity. It’s a way of living that distinctly stands out among the vast crowds. Why would God need the Israelites to send spies? Didn’t God know what was there, wasn’t He with His people? Why not just march in and conquer? After all, hadn’t God promised this land to them? It was a test. God wanted to test the Israelites to see if they truly depended on Him and His promises to them. He wanted them to have a full picture of what they were going against in God’s name. Joshua and Caleb were not only willing to be leaders of Israel (Numbers 13:3), enjoying the privileges of prestige and power but he was also willing to go on the difficult and risky forty-day spy mission into enemy territory (Numbers 13:17). 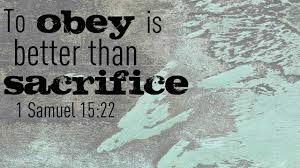 Today’s Christians practice “selective obedience” — obeying what is easy, and ignoring what is difficult and unpleasant. These men were willing to do what was required to be a leader. They were willing to sacrifice and obey. Many Christians obey God’s command to gather together for Sunday worship but ignore the command to separate from worldliness, be witnesses of the Gospel, contend for the faith and serve the LORD whole-heartedly. “Selective obedience” is disobedience. When we choose what to obey, we are effectively telling God that we are His masters and have the right to decide for ourselves. Such people do not understand the meaning of obedience. These men were willing to make themselves vulnerable for the sake of others. This group of leaders when they left the Israelite camp had a huge metaphorical target painted on them. If they were to be found out as spies, they most certainly would have been killed. If we are to reach our world for Christ, we must expose ourselves and let our guard down. While it is true that if we never share our faith, or serve our neighbor, or minister in Christ’s name we will never be embarrassed, or have a sore back, or have time away form our pleasures. This is however a life lived selfishly. They were willing to lay down their own lives for the sake of others. Are you willing to lay down your life for the sake of others? Whole-hearted Christians look for opportunities to be vulnerable for the sale of Christ and are willing to lay down their safety, comfortableness, personal resources, and even their lives for the opportunity to serve Christ. God through Moses gives a plan for the spies to follow. He specifically gives them the route they are to follow and tells them what to look for. Moses let’s them know specific things that will be beneficial to their conquering the land. Moses picks out one man from each of the twelve tribes. These twelve men act as a sort of commando group behind enemy lines: scouting the land; counting soldiers, horses, and chariots; checking out Canaan’s readiness for war; looking at city walls and gates. For forty days these men cautiously travel through the land watching, looking, counting, measuring, and taking notes. Even before the report of the spies comes back, Moses is trying to discover the plan of attack, after all this was the Promised Land, and God has always been faithful. We see that these leaders follow this direction and it takes them a vineyard where they are able to carry off a huge cluster of grapes. 21 So they went up and explored the land from the Desert of Zin as far as Rehob, toward Lebo Hamath. 22 They went up through the Negev and came to Hebron, where Ahiman, Sheshai and Talmai, the descendants of Anak, lived. (Hebron had been built seven years before Zoan in Egypt.) 23 When they reached the Valley of Eshcol, they cut off a branch bearing a single cluster of grapes. Two of them carried it on a pole between them, along with some pomegranates and figs. 24 That place was called the Valley of Eshcol because of the cluster of grapes the Israelites cut off there. 25 At the end of forty days they returned from exploring the land. Their first discovery, the cluster of grapes, was so big that it took two men to carry its weight. Here was the proof that the land was truly “flowing with milk and honey.” At the end of forty days these leaders brought back their experiences and this cluster of grapes. God brought back evidence that He is being faithful, yet again. Has God ever been faithful in your life? We, like these men, are to carry around with us the proof that God is faithful in all of His promises. The second discovery is not as nice as the first: the descendants of Anak, or, as they are called elsewhere in Scripture, the Nephilim. The Nephilim are a race of giants, mighty men who inspire fear and dread in the hearts of lesser men (cf Gen 6:4; Deut 1:28). Some Christians are willing to obey all of God’s commandments – as long as it does not cost them too much. They are willing to give or serve in any ministry as long as it does not demand too much sacrifice or effort. They are willing to separate from ungodliness and contend for the faith as long as it does not cost them the loss of friends. Caleb and Joshua were willing to honor God though they were outnumbered. They hold to God’s promises and give a faithful report against millions and even to the point of being stoned to death (Numbers 14:10). If you were part of Israel and were listening to the report of the spies, what would your reaction be? How would you look at the Promised Land after hearing the report of the spies. 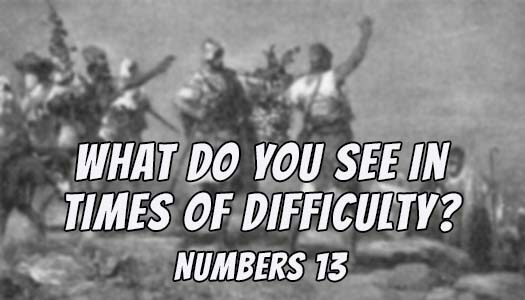 Numbers 13 relates for us two different ways of looking at the Promised Land. I. The first way of looking at the Promised Land is the way of ten of the spies. These ten looked at the land and came to the conclusion it could not be conquered. They said, “The land we explored devours those living in it” (Num 13:32). The land of Canaan was unusually fertile and was fought over by those tribes and nations looking for a homeland or a better homeland; so its ownership was constantly being contested. Also, the land of Canaan stood at the crossroads of Asia and Africa. Invading armies and traders from both continents passed through the land and also contested its ownership. They also said “We can’t attack those people; they are stronger than we are” (Num 13:31). The Canaanites were so big and so strong that next to them they felt like little bugs, they felt like grasshoppers next to giants (Num 13:33). Imagine this! For two years the Israelites had been traveling to reach the Promised Land. They had faced enemies, drought, hunger and they had spent long hours traveling through the wilderness. Their goal was the land of Canaan. Finally they were at its border. The spies went into the land. They found grapes of such enormous clusters they had to be carried on a pole by two men. The Promised Land was even better than they had dreamed it would be. These spies did not have the eye or faith. II. The second way of looking at the Promised Land was the way of Joshua and Caleb. They simply said, “We should go up and take possession of the land, for we can certainly do it” (Num 13:30). These two did have the eye of faith. Ten of the twelve spies sent out by Moses to scout the Promise Land also spoke disheartening words at the critical hour; they spread gloomy tidings about the colossal power of the native people; they frightened the Israelites with their talk of giants and grasshoppers. The real tragedy here is that majority of the spies were blind to the power of God. They forgot the miracles God had done. They did not view the Promised Land through the eye of faith. So they became scared and pessimistic and discouraged. Joshua and Caleb, on the other hand, were optimists; they were full of courage. What makes some people courageous and others cowardly? Courage has to do with what we see. The ten spies saw the same thing with their physical eyes. The inhabitants of Canaan were heavily armed giants. Joshua and Caleb saw them too, but they saw more; with their spiritual eyes they saw God. And that gave them courage. By looking at Canaan through the eye of faith they saw a land that their covenant God would give them just as He promised. With God they knew that nothing was impossible. Like Israel it seems that there are impossible tasks in front of us some times. We have been called to possess and claim the earth in Christ’s name. What a big job! If we look at this challenge without the eye of faith, the world looks scary and our mission seems like an impossible venture. Faith says all things are possible with God. When we look at our seemingly impossible tasks with the eye of faith then the impossible become possible. The Bible says that all things and all people will someday bow down before God and His Christ – even giants and fortified cities. I want you to notice what happens when God’s people take their eyes away from God and His power. Turning a blind eye to God results in unhappiness. For even happiness and security is a matter of what one sees. The first three verses of Numbers 14 tells us what happens. The people did not look at the fortified cities and giants with the eye of faith. So they became scared and unhappy and actually wanted to go back to the slavery of Egypt. Their lack of faith made them so unhappy that they wept. They wept for the entire night. Without faith life becomes scary, threatening, frightening, and discouraging. For a number of years sociologists have been conducting tests to determine what makes people happy. They have finally concluded what we Christians have known since the days of Christ. We know that jobs, living conditions, sexual satisfaction, wealth, etc. have little to do with happiness. Professor Jonathan Freedman of Yale University concluded his study vaguely with this statement, “Happiness is in the head, not the wallet.” Happiness depends upon how one looks at things. Happiness depends upon the eye of faith. Being a Christian doesn’t automatically bring happiness. Because you know as well as I do that there are many unhappy Christians. Yet, deep down within their hearts, Christians know the secret to happiness – a quiet trust and faith in Christ as Savior and Lord.